I’ve got several more 78s from Europe already in the queue for future posts, so I thought I’d take a break and return to Africa. I hope this might interest listeners who discovered this blog via the fine Benn loxo and Matsuli Music sites. The French, because of their large colonial presence in Africa, were also at the forefront of recording African folk music. Their reach may not have had the span of the Gramophone company in England (or the variety), nor did it – as far as I know – have the brilliance of a local ethnomusicologist behind it such as Gallotone with Hugh Tracey. But it was formidable. While it’s true that the Phillips label produced hundreds if not thousands of recordings up and down West Africa, there were numerous smaller French (and Belgian) labels recording classic examples of local music throughout the continent. Africa Vox, for one, specialized in raw, field recordings. Le Chant du Monde recorded African popular songs. Ngoma, Loningisa, and Opika recorded in the Congo. And then there was Fiesta, the label of today’s track. 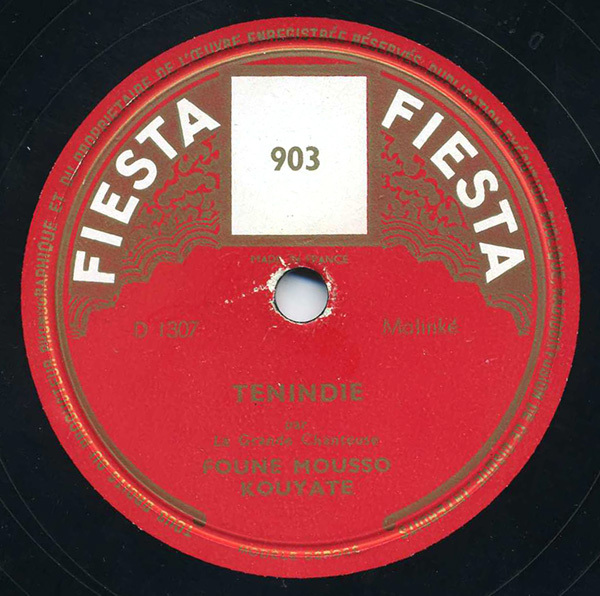 Fiesta appears to have been independently owned (and bears a suspicious label resemblance to the Congolese Opika label), and pressed in France. But it may not have been independent. I have no idea! Regardless, Fiesta was a presence in both French West Africa and the Congo, where they also recorded. Ms. Kouyate, “Le Grande Chanteuse” as she is credited on the label, is unknown to us. She is accompanied by two bala (or balafon) players, and chimes. They were Malinké, which would most likely place the recording in Guinea, Mali, or Gambia. He might like to know about this one as there is a gap between 900 and 906. Most of the French West African Fiestas feature Malinké (Mandinka) musicians and style; you can find them in southern Mali and Burkina Faso and the north parth of Guinée (Conakry) and Côte d’ Ivoire . This shellack is not a exception, the balafon sounds deeply Malinké.